Local honours ended up even in a goal packed West of Scotland Football League clash at Dreghorn Primary. After some deadly finishing from the visitors the home side showed true fighting spirit to battle back from two goals down. There was a spark to this game from the start and it was Irvine came out of the traps first, taking the lead on 2 minutes. A long ball drifted into the box down the left channel, evading the home defence, and Jamie Craig was on hand to deftly control the ball and fire past Chris Taylor. 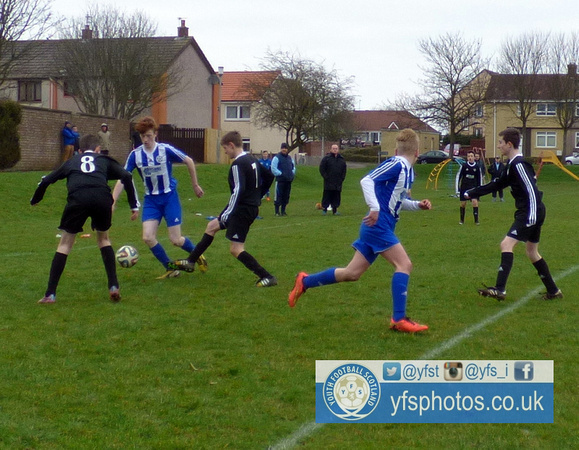 It was to take Dreghorn a few minutes to recover from this initial shock and find their bearings in the game. Thistle pushed up and on 7 minutes almost doubled their lead when Declan Wilson fed the ball through to Bob Allison who flashed just wide. Before long the hosts started to get a foothold, and composed defending by Rory Anderson helped relieve the early pressure and get his side up the pitch. Dreghorn started to win some possession in midfield, with Sean Wells pulling the strings to threaten the Irvine goal. Dreghorn went on to pile on the pressure, with striker Sam Rennick’s first attempt held by Aiden Smith in the Irvine goal.. Captain Rhys Graham also posed an aerial threat from set pieces. After firing a free header just over from a corner Graham then forced a fine fingertip save from Smith to keep Irvine’s noses in front. It felt like an equaliser was a matter of time and it arrived in some style on 27 minutes. Gathering the ball in midfield Rennick galloped down the right channel before angling an explosive drive low into the far corner. The hosts were deservedly back on level terms. With a spring in their step Dreghorn then went on to win a penalty on 35 minutes. Sean Crawford was brought down just inside the box by onrushing keeper Smith, but from the spot the keeper made amends, saving Robbie Handling’s shot with his legs. This miss was turn to double disappointment for Dreghorn as Thistle fought back up the pitch to retake the lead. Taking the ball down the right channel Liam Reilly threaded the ball through to Lewis Quigley. The winger’s powerful shot-come cross gave Taylor no chance, crashing into the far postage stamp on 40 minutes. Dreghorn’s heads seemed to drop, and they hoped to just get to the break one goal down and regroup. It wasn’t to be though, as Irvine pushed further ahead right on the interval. Thistle won a free kick down the left and the high set piece was headed home by Luke McSwiggen to give the visitors the perfect half time team talk. After only a minute of the second half they had a goal back. From the left long throw specialist Sam Monaghan looped the ball into the box and it was headed home by Graham to reduce the home arrears. The hosts pushed on for an equaliser, with Wells orchestrating attacks from midfield and Handling’s dangerous runs down the right posing problems for the Irvine rearguard. Handling was unlucky on 55 minutes with a run and shot striking the outside of the post. But despite all the pressure the visitors still looked dangerous on the counter, and Taylor was called into action, firstly after a speculative long range shot from Quigley, and then rushing out to block a mazy meandering run by Stephen Gilfinnan down the right. Finally after all the to-ing and fro-ing Dreghorn were back on level terms on 70 minutes. Another dangerous corner was fired into the box by Handling meeting the head of Lewis Clark to finish from close range. And so it was down to last 20 minutes for these two neighbours to find a winner. Dreghorn continued to push forward with chances falling to Monaghan and Rennick but Irvine held out for a point. Dreghorn will wonder what might have been from a game which perhaps sums up their season. They will hope to push on from here for a top four finish and a place in the cup final. Sean Wells. Kept driving his side forward in midfield. Lewis Quigley. Dangerous runs forward. Good goal. Sam Rennick's spectacular long range equaliser. McSwiggen's header on half time gave the visitor's the perfect half time break. Paul Kellington, Head Coach: "It has been a frustrating season and this game kind of sums it up. We only seem to raise our game for the teams above us. Hopefully we can get up the league and get to the cup final. "